DURHAM, NC--(Marketwired - December 14, 2015) - In a classroom, every second counts. The speed and efficiency of the technology you use can mean the difference between students staying on task and falling behind. 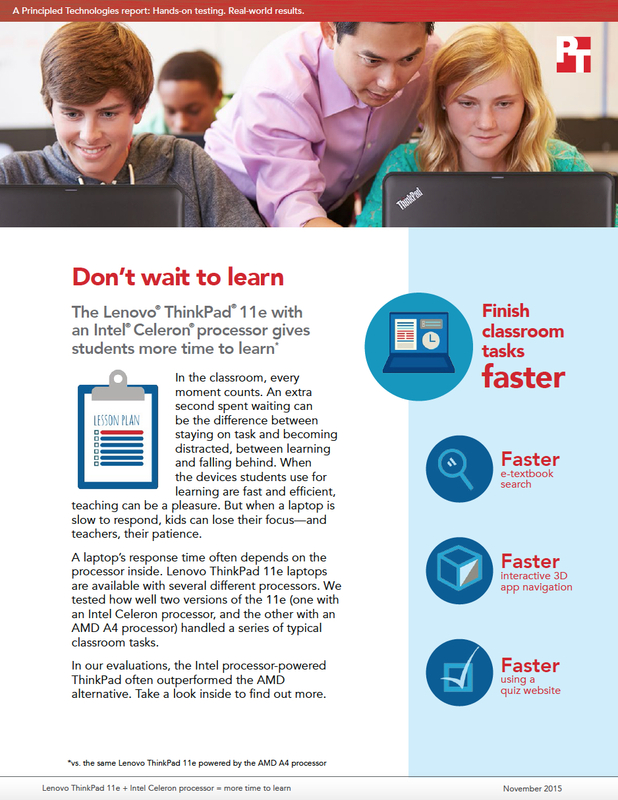 Principled Technologies compared a Lenovo ThinkPad 11e powered by an Intel Celeron processor to one with an AMD processor in order to see how well the devices handled a series of classroom tasks. In the hands-on PT evaluation, the laptop powered by Intel accomplished many of the tasks faster. Plus, only the ThinkPads powered by Intel were available in the multi-modal Yoga version. To learn more about how choosing the right processor can give students more time to learn, see the full report at facts.pt/1QbWYTO and the infographic at facts.pt/1QwAtcp. Give students more flexibility with an Intel processor-powered ThinkPad 11e. You could streamline classroom activities with a ThinkPad 11e powered by Intel.